Before Christmas, I had a lovely phone conversation with Emma Monro who had recently launched The WAHM Weekly (it’s now 3 months old). She has an exciting programme of weekly Webinars on a Friday evening to help other WAHMs (Work At Home Mums) network, learn and achieve. 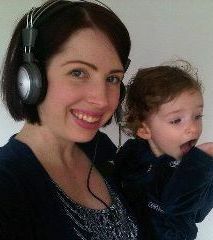 She’s Brisbane-based and pictured here with daughter, Ruby, 18 months. After consulting with ‘normal’ business’ for so long, I missed the events, networking and educational opportunities that I once had access to. I also know how important it is to do these activities on a regular basis. And so I created The WAHM Weekly in September 2011. I am passionate about bringing Live Web Events which will inspire, educate and help you build your business. I continue to run my property business from BC. I was also a Business Consultant with Bartercard for 10 years. A lot more peaceful with the same amount of excitement and passion for small business. Use a goal board to plan your activity. Have it in an easily viewed place where the whole family can have imput and use it to inspire each other. The amount of day sleep they had and how much I miss the freedom of the day sleeps now they are diminishing. What is a moment you have been proud of in the last few months? The fantastic feedback I have received about every one of the web events I have hosted. What is one of your biggest challenges of the last few months? We are doing a full house renovation at the moment, so I have nailed a piece of board next to the temporary kitchen. 4am start, work for 2 hours, breakfast with the family. Play/house stuff. Ruby sleep, work while she is asleep. If I get my list of things done, I will have a nap too. Play/house stuff. Bed for Ruby. Dinner. Relax time. Bed/read. That it is all about ‘doing coffee’ and swanning about in Lorna Jane gear. Does your child go to daycare? Not yet, we are on a waitlist. Soon for 3 days a week. You can try out the Web Events for WAHMs for just $2 for the first month by signing up here. Then it’s $15 per month, a reasonable fee to support the wonderful work that Emma puts into organising these online events. If you miss the actual event you can watch the archives. You can also Follow The WAHM Weekly on Facebook. A huge thanks to Emma for sharing, I’ve been impressed by how much she’s achieved in a short time – now I can see that getting up at 4am is one of the sacrifices to do that! Renee Veldman-Tentori, Professional Parents, visit our website or join our Facebook page.